Today I got out of bed at 6:30 AM (okay, 6:40), took a quick shower (which is next to amazing for me), and marched myself over (I loooooove living within walking distance!) 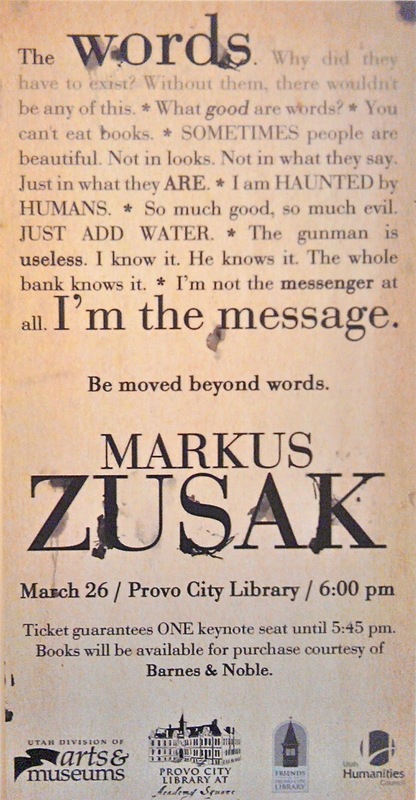 to the Provo City Library by a few minutes passed seven to wait in line for tickets to the upcoming Markus Zusak Lecture. I was the ninth person there. It was a beautiful morning and one of the first ladies even got donuts for us all! Eventually others started showing up, even a few men (it was kind of funny, but not surprising, to notice that most of the waiters were womenfolk). At nine on the nose we were let inside and trooped up the stairs to the gallery (I had never been up there before. It's very nice. The little hall outside of the art gallery has display cases on either side, decorated for the two upcoming lectures, Brandon Mull & Markus Zusak. In the Mull Fablehaven cabinet I noticed a plush unicorn. Ha! I used to sell that unicorn when I worked at the toy store in Virginia). I got my free tickets so lickety split, walked back down the way I came (which I probably shouldn't have done because of the long line, but I wasn't familiar with the upstairs! ), marched back home and reveled slightly in my accomplishment. Then I went to a Relief Society service activity/luncheon and talked books and such with some nice ladies (we just happened to sit at the same table! It was great). Oh how I love books.